Adding an extra layer of warmth with our variety of printed quilt and printed cotton quilt our incredible collection of printed quilts emulates an experience of handcrafted quilts to any home decor. 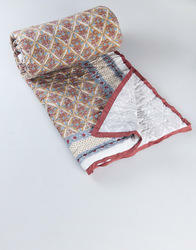 We have uniquely positioned in the market by offering a wide array of Block Printed Quilts. 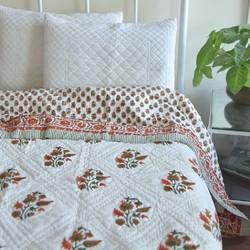 These quilts are warm and very stylish in design. 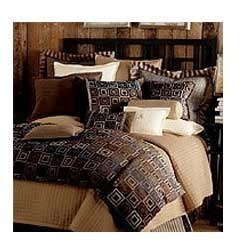 These quilts are smooth and available in eye catching design. Known for softness, these products are available in many colors and shades. The whole range is tested on well defined parameters before being supplied to the patrons. Warm any room with the soft hues of Chambray and Trellis quilts. For each, choose (shown top to bottom) pink, blue, or yellow. Trellis has bands of stripes interspersed with floral-patterned bands; reverses to a mini floral print. Chambray solids reverse to matching ticking. 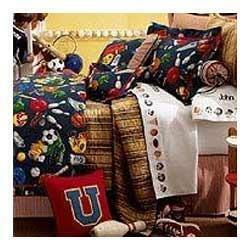 We are an affluent name in the market by offering a collection of Cotton Printed Quilts. These quilts are available in printed design and known for sleek texture. Designed as per the demands of the customers, these products are widely acknowledged in national and global market as well. Known for fine and perfect stitching, we provide these quits at market leading prices. Exclusively ours. Catch a retro vibe with these geometric print linens. • Cubed linens, cube and stripe designs in shades of tan, baby blue, ivory, and orange. • Striped dust skirt, box pleats; linen with grosgrain ribbon trim. 16" drop. 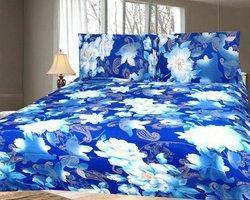 We are leading manufacturer and supplier of Printed Quilts. These quilts are printed and look very stylish. It can be used for domestic as well as commercial purposes. Mix and match innovative linens in a variety of hues and textures. Chinese Peony Linens: Pink/blue stripes with orange/white/green floral motif; hand quilted. Machine wash. Pillow (shown back), red/pink/yellow/orange/white peony design. Micro hooked wool, yellow velvet back; down-filled. Spot clean. Keeping in mind the current market trends, we are engaged in offering our customers best and most appreciated collection of Designer Printed Quilts. These quilts are fabricated by skilled workers in line with international norms and standards. 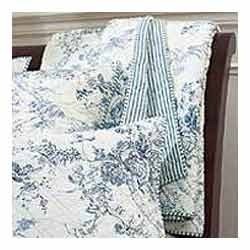 These quilts are best in class and highly admired for its printed designs. Available at reasonable prices, these products provides warmth and confirmability in winter. Add an extra layer of warmth and Provencal charm to your linens with our floral quilts. Choose (shown top to bottom): saffron (yellow), green, blue, or raspberry. Handmade of 100% cotton broadcloth. Got game sporty linens for your little fan. • Sports linens, navy blue with multicolor sports motif; red trim. • Dust skirt, red stripes; 15" drop. 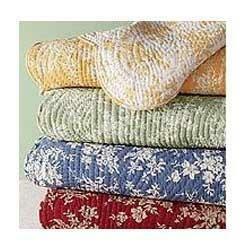 • Striped quilt and shams, yellow with multicolor stripes; quilted. Sweet and simple the perfect linens for spring. 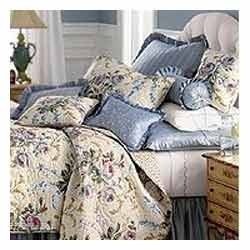 • Elvire linens, multicolor floral print with blue stripe and dot accessories. • Dust skirt, blue/white stripes; 18" drop. Stripe and dot accessories, blue/white; 100% silk. Dry clean; made of materials. Rustic charm a delightful blend of patterns and materials. 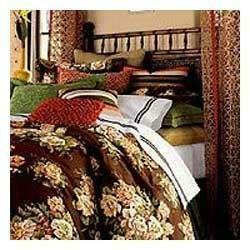 Treillage linens, brown with multicolor floral motif, damask, and grosgrain ribbon. Sheeting, white with two rows of brown bias ribbon tape. 210-thread-count Egyptian cotton; machine wash.
Lattice curtains, tan and red; ribbon tie-tops and trim. 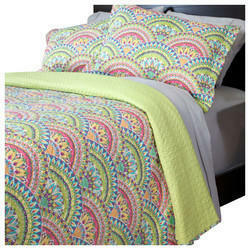 84"L x 54"W.
Make your bed pop with these eye-catching, bright linens. • Beaufort bedding, deep fuchsia with silvery metallic embroidery; plush quilted cotton sateen. Get into shape geometric linens with modern appeal. Washington Squares Linens: Large circles and squares in brown and slate hues; suede accents. Striped dust skirt, tan with woven stripes; tailored. 15" drop. Curtains (not shown), lined; rod-pocket style. Set of two; 50" x 84". Includes tiebacks. Valance (not shown), straight; 100"x 18". Fabric, 3 yards x 54"W. Acrylic/polyester; dry clean. Exclusively ours. Hot tropics enliven your room with this vibrant bedding. 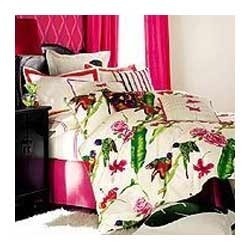 • Bird of paradise linens, ivory with multicolor tropical bird and floral print. • Dust skirt, solid pink linen; tailored. 17" drop. • Shams, ivory with pink grosgrain ribbon border. • Sheeting, ivory with pink embroidery. Fitted sheet, solid ivory. 275-thread-count Egyptian cotton; machine wash. Made of Italian fabric. Looking for Printed Quilts ?